My fiance has been eyeballing new watches for quite a while now. His old leather watch just completely broke and his arm is feeling a little empty as of recently. He is pretty specific about what he likes/doesn't like, and it has to be pretty rugged because he works in a warehouse all day. After a bit of hunting I managed to narrow it down to a few styles that I thought he would like, which upon prompting him didn't like ANY I had chosen! So it was back to the drawing board. I was going to give Chris a watch for Christmas - but I settled for his birthday instead (which is why you're seeing this now). 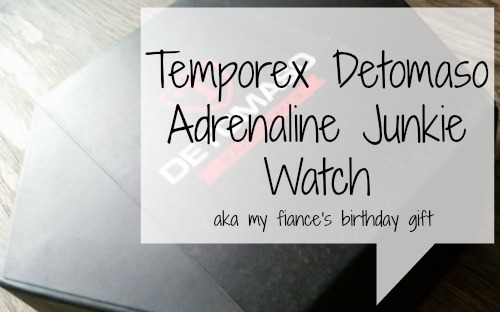 For his birthday I managed to procure a Temporex Detomaso Adrenaline Junkie watch. And it is GLORIOUS. It manages to tick all of the marks while still being attractive AND accurate. The watch itself is gorgeous with a thick black silicon band with this awesome treading (like a tire) that holds the watch in place on your arm so it doesn't twirl around your wrist all day. Chris's old leather band watch had a tendency to twist around his wrist in the end and the face was too big to wear comfortably when it did that. The watch face is both pretty to look and easy to read. It has a sporty/sleek design that was comfortable and wasn't bulky on his arm at all. Men's watches have a tendency to get bulky quite fast but this one was the perfect balance and looks so good on his arm. Color-wise it's the perfect blend of black, red, and silver (stainless steel) & all Chris's favorite colors. The case is stainless steel and the glass on top is sapphire coated which helps it resist shocks and bumps from everyday wear. The face is a gorgeous black and red with hands that look like fangs (I think they look that way anyway). It gives it a very sleek and sharp look which both Chris and I appreciate. Overall, this was an absolutely great gift and he is so satisfied and happy with it so I know it'll be a great watch for him in the years to come. This was the perfect birthday gift and I kinda wish maybe I had held off until Valentine's day - because now I don't know how I'll outdo my own self! You can buy this watch on Amazon here & the official page for it is here. 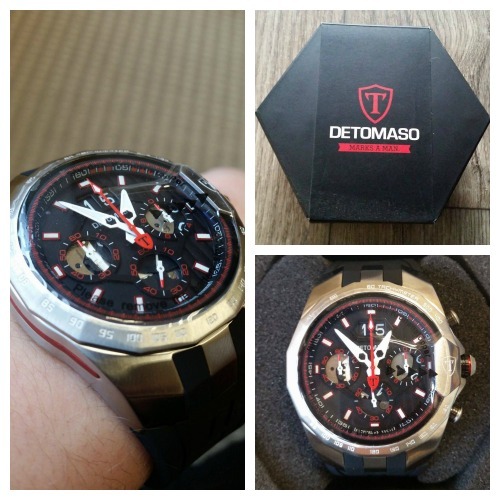 They have some gorgeous mens watches that are perfectly priced for Valentines/Birthdays! *This is a sponsored post, thanks!